ChartwellWeb is a small website design and development company based in Liss, Hampshire on the edge of the South Downs National Park. It is a very beautiful part of the world and we take inspiration from it every day. We offer a range of Website Design, Consultancy and Software Training services. Contact us today to see how we can help you get the most out of your business. Working with Chartwellweb has been a pleasure and has taken the pain out of logo design. I had some ideas but Chartwellweb made small changes that had big impact on my final design. They made the whole process easy from initial ideas through to final design. I can highly recommend Chartwellweb. Once we had decided that Vemcast Limited would benefit from internet exposure, then came the perplexing decision of what company to use in order to initiate the process. ChartwellWeb were recommended to us by business colleagues, and from our initial meetings to the completion of our new website, we have been extremely pleased with the professionalism and attention to detail afforded us, along with the first rate after-service. ChartwellWeb did a complete re-design of my website and has helped no end in driving the site forward. Whenever I need any help with graphics, images or processes, ChartwellWeb are my first port of call. Their knowledge and experience is very valuable to us at Lindsay Interiors and we are very grateful for the help. Very happy with our website. We've had loads of bookings from new customers since it's gone live. ChartwellWeb are a great bunch to work with. Cameron Homecare approached us with some ideas for a website prescence for their new venture. 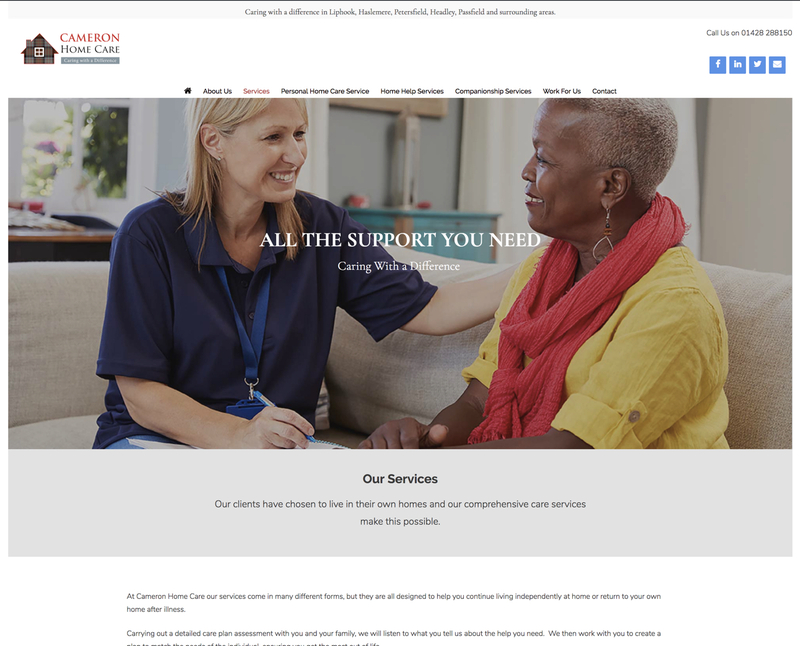 They wanted a website that would reflect their business and that would demonstrate that engaging with a care provider who puts the clients first is the way forward. For more information about Cameron Home Care's services please call Ian Cameron on 01428 288150.